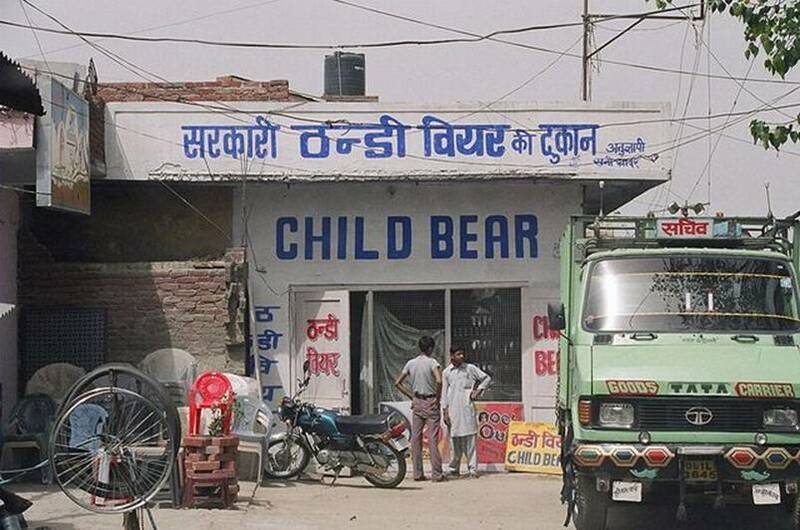 I can Waak Engliss..I CanTaak Engliss..
Care for some “Child Bear”..hic?!! And …ummm.. the title ..think ‘Namak Halal’ and AB..and the cricket commentary depicting Vijay Hazaare..That brilliant scene written by Surendra Kaul ..AAhh..they dont make legends like these any more!! Great catch. brings back memories of my college days when one of our profs had this picture collection of shop signs and truck behinds and their interiors too. if one notices they are full of personalised spaces. Jidda..Oh Yes!..none can beat the quaintly original signs behind trucks.They are often so amusing that sometimes, overtaking is no longer a crying compulsion..
Like the one we saw on our way to Mahabhleshwar..it read “Aaj mood nahin hai”..thats it..leaving it to your imagination as to the areas of reference.It was hillarious..and the reason for having it behind his truck is what kept us in splits…I mean..Why? aha u have opened the ‘fundoraz baxa’ for me n i won disappoint u!! – “Sair..may eye go to toilate..” if u read this verbatim!! sum studentz used to imitate teachers weak in english..
– one class mate, brilliant though was a ruffian in class.. so our mathz sir, in class 12 before the boardz.. ‘aooo!ayes! u! rasceel! i know ur impotent for the ISC but still aoo get out talkative learnd man’!! can go on…. its the diction, the accent n the wonderful mish-mash of wordz combined wit the vernacular spoilz tat render angreeji, its indian flavor- guess we all in different wayz swear by!! in various permutations and combinations..
That scene from Namak halal you mention is the only I remember form that film. One of the all time greats of those enacted by Amitabh Bachchan. Thanks for providing the name of the writer. They often get ignored while those on screen get all the credit. Hmmm.. writers are perhaps the the most under rated,under acknowledged and at once a rare breed these days in Bollywood. If there is one refrain you hear constantly from film makers it has to be ‘ Where are the writers?’By this of course one is alluding to those worth their salt..the others are just transcription and translation specialists. The writer in question here Mr. Surendra Kaul and his talent can be gaged from the film and the character he has constructed.. the lovable boy with his ‘dadu’..It is unforgettable..original and so well etched.